Technology deployment is essential to thrive and evolve in today’s business world. Companies willing to adopt cloud-based enterprise solutions are able to gain a competitive edge in the market and they have reported higher profit margins in recent years. A recent report from the Harvard Business Review points out that the deployment of cloud-based business apps has helped organizations to extend efficiency, increase innovation, and derive new insights into their processes. Integrating an Enterprise Resource Planning (ERP) system to your e-commerce store will not only streamline the entire process but also lead to greater efficiency and higher profitability in business. However, choosing the right ERP for your business is a major challenge as each system comes with a set of advantages and complexities. Designed for mid-sized and large organizations, Microsoft Dynamics AX has been one of the most powerful ERP solutions in the last few years. The latest offering from Microsoft, Dynamics 365, comes with more features and functionalities for streamlining business processes. Given its numerous benefits, most companies are contemplating migrating to the Dynamics 365 now. In addition, Microsoft has announced that it will end the support given to AX in the coming years. The numerous e-commerce business benefits arising from migrating to Dynamics 365 are expounded below. Launched in 2002, Dynamics AX is a popular ERP solution from the Microsoft Dynamics product line. It is a feature-rich resource-planning tool that helps enterprises to organize, automate, and optimize their business processes. It is an adaptable business management tool that streamlines various processes like finance, HR, manufacturing, customer relationships, etc. However, this ERP solution is officially retired now and is not available for new users. Dynamics 365 for Finance and Operations, previously known as Dynamics AX 7, is a complete cloud-based ERP solution with enhanced features for seamless user experience. Both Dynamics 365 and Dynamics AX are built with advanced business intelligence capabilities that help users to build user-friendly dashboards. Although the features look similar in both cases, many of the existing features and functionalities in AX are available in its updated version in Dynamics 365. The major difference between Dynamics 365 and Dynamics AX is that the former is available in the cloud, on-premises, or through hybrid deployment options. The latter, on the other hand, requires a server room and supporting infrastructure. In fact, Dynamics 365 Financials and Operations can be deployed and accessed anywhere, on any device, using an active internet connection. While CRM and ERP solutions are used separately in AX, Dynamics 365 offers a seamless transition between the two. In addition, Dynamics 365 can be seamlessly integrated with other Microsoft products such as Office365, PowerBI, etc. Workspaces – This feature in Dynamics 365 allows users to personalized work centers with data, reports, and transactions, which, in turn, lead to increased employee productivity. It allows customers to use multiple aspects and features of finance and operations simultaneously through a customizable dashboard. Relevant Search – Powerful and intelligent search engines help users find data anywhere from the global database instantly. Reporting – Dynamics 365 allows users to create highly-intuitive business intelligence reports that can be embedded in the interface of Finance and Operations. Powerful PowerBI – PowerBI in Dynamics 365 is powered by Microsoft’s Azure Cloud Platform, which allows users to create customized data charts and reports quickly and efficiently. Increased integration – Dynamics 365 allows users to integrate entire business process applications related to Customer Relationship Management (CRM) and ERP solutions into a single unified system. Thus, it becomes easier to access comprehensive data on pricing, inventory, orders, invoices, clients, accounts, etc., anytime. Operational Efficiency – By synchronizing different modules in ERP in a single platform, one can monitor and evaluate the operations and finance of the business anytime, anywhere. This feature allows users to make smarter business decisions swiftly and function with maximum efficiency. Scalability – The adaptability and scalability of Dynamics 365 help e-commerce businesses to ensure its capability for rapid and exponential growth. It is based on Azure, which is a Software as a Service (SaaS) solution. Unlike traditional methods that rely on physical infrastructure, it automatically scales up and adapts to a new influx of data and level of usage both swiftly and securely. Hence, you can focus on growing the business by switching to the Dynamics eStore. Customization – Every business is unique and has a set of bespoke requirements. With its amazing customization possibilities and modular design, e-commerce Dynamics 365 ensures the flexibility required for all business models. Being an app-based solution, companies can swap out or incorporate modules and apps that are suited to optimize their business operations. Cost-effective – Dynamics 365 offers a flexible licensing structure, which means that users have to pay only for the applications and services that they use. Enhanced customer experience – Customer retention and customer satisfaction is always a priority for any e-commerce business and it becomes an effortless task with Dynamic 365. It is efficient in tracking, managing and measuring the life cycle of the customer. In addition, it becomes easier to identify high-profile customers by analyzing their buying patterns. If you want to provide cross-channel buying experience for your customers, it is also possible with Dynamics 365. Multimedia product catalog – With Dynamics 365, you can showcase your products attractively by integrating multimedia features and multilingual content. Better security – Data security is an exceptionally important concern for any e-commerce business. Dynamics 365 includes enhanced tools to protect customer data and sales data while offering control over its data security protocols. Budget management – Dynamics 365 helps in budget management by predicting future demand trends and recommends prompt tactics. It allows budgeting teams to anticipate expenses for the future and take the necessary steps. Dynamics 365 is an excellent and highly adaptable ERP solution for enterprises, especially for those involved in the e-commerce sector. It is the only end-to-end intelligent-ERP solution that integrates with CRM, Internet of Things (IoT), Business Intelligence, Artificial Intelligence, and more. For forward-looking organizations, migrating to Dynamics 365 is an indispensable step. Apart from that, the days of Dynamics AX are counted and it is not a wise decision for the organization to delay the upgrade. 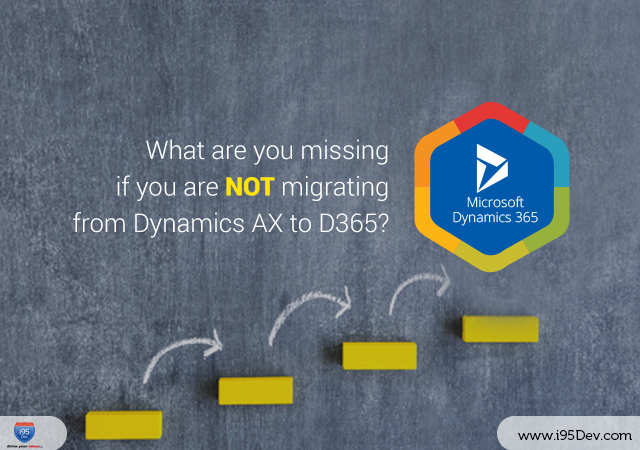 Need assistance to migrate from Dynamics AX to 365? Allow our expert team to help you with your requirements! Get a personalized demo of our Magento Dynamics 365 integration platform.